Today I have a roundup of several cheek products from Urban Decay including the UD x Gwen Blush Palette ($45), Afterglow 8-Hour Powder Highlighters ($26 each) and Beached Bronzers ($28). All the items are very pretty and give the complexion some life and color in a natural way. The UD x Gwen Blush Palette in my opinion is one of the best blush palettes I’ve ever tried. It has a good mix of cool and warm and also matte and shimmer finishes to give you a lot of options. The colors layer nicely and application is smooth. I do find some similarities between the colors in the palette and the new highlighters/bronzers. You may want to shop your stash too as some of these will probably be duplicates or similar to what you own but more thoughts on each one below. 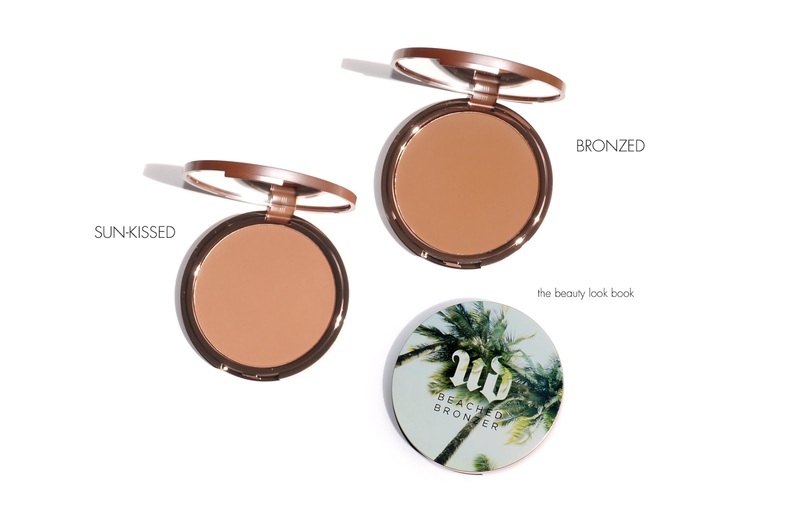 First a quick look at the cheek, highlighter and bronze items from Urban Decay side by side. I’m trying out a new interactive tool so you can shop the images by clicking on the icons. Let me know what you think! Up first is the UD x Gwen Blush Palette. This comes in a medium-sized mirrored compact similar in style to the UD x Gwen Stefani Eyeshadow Palette. The packaging is very sturdy and well made. The colors have medium but buildable pigment and the texture is very soft and smooth. There is quite a bit of powder kick-up when I dip my brush into the powders but it’s easy to clean up and once the product is on the face there isn’t any fall out. Cherry is a soft cool matte pink, Easy is a medium rose with gold shimmer, Angel is a soft champagne gold, Lo-Fi is a medium tan, Hush is a shimmering peachy champagne, OC is an iridescent soft peach that flashes pink. As you can see from the swatches above near the top of the post, Angel has a similar effect to the Afterglow Highlighter in Sin, Lo-Fi is a more yellow toned version of the bronzers, OC has a similar pinky sheen to the Afterglow Highlighter in Fireball. I would say by comparison the Blush Palette has a softer more natural look on the skin compared to the others. 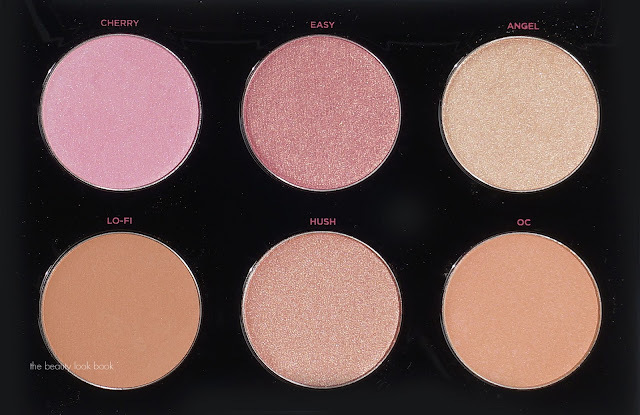 I love this palette because it’s so versatile and goes well with a wide range of looks. That being said the colors are fairly standard and I suspect you can find similar shades from MAC, NARS or other brands. I do really like that Easy Blush is a rose gold that is medium in undertone but doesn’t darken on my skin. So many rose blushes end up darkening and look muddy on my skin while Easy stays true to color. Angel has that pretty warm golden champagne undertone which makes it look soft and diffused on my olive skin. Hush is borderline a highlighter so I mix it with Lo-Fi to add more color on my skin. Next up are the Afterglow 8-Hour Powder Highlighters. These are designed to be long-lasting and the claim is they last 8 hours. On my normal combination skin I found they did not last on my cheeks for the full 8 hours. I would say color stayed true from morning around 8 am until 2 pm (so for around 6 hours). After that the color faded a bit. It was still visible but there was noticeable fading, at least on me. The colors are very pigmented and intense but are easy to blend and buff out. I’ve swatched them heavy and blended to try and show the difference. The heavier you swatch these the more intense the shimmer and with a heavy hand the colors are lighter in color. Sin is a pale champagne gold, on my skin it looks very pale, almost like a pale cream. Fireball is an iridescent peach that flashes pink. Aura is a pale pink that flashes slight pink and blue tones. Shimmer-frost wise I think these are definitely on the more shimmery side but they blend out smoothly on the skin. Sin is the most frosted on me since it has a sharper contrast to my olive skintone. I expected Aura to look really frosty but on the face it gives the skin a pretty glimmer. Fireball has a smooth shimmer that isn’t overly frosted. 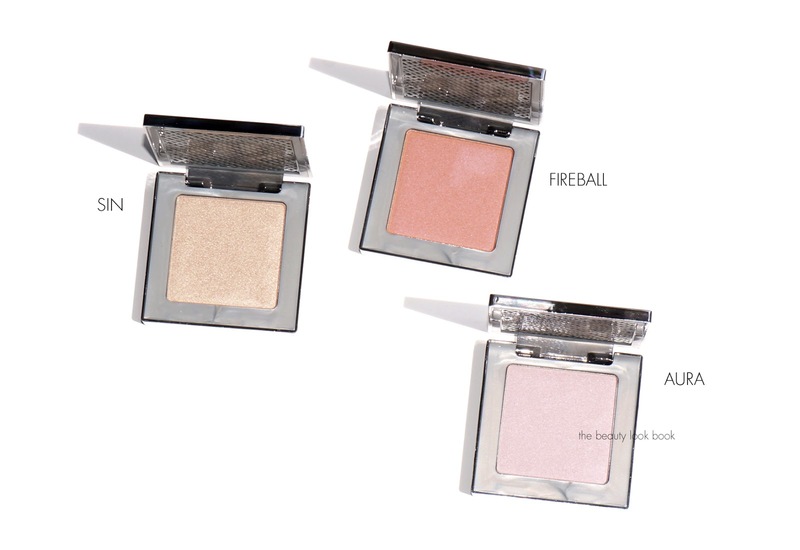 I didn’t have time to reswatch comparisons, but Fireball is similar to the Anastasia Hard Candy Highlighter reviewed here and Aura compared to the Laura Mercier Highlighters in this post here. Sin is one of the more unique shades I own for highlighters but it has a similar effect to that of MAC Nylon Eyeshadow. Last up are the two Beached Bronzers. These are matte bronzers that come in round mirrored compacts. I love the packaging – the palm trees add a fun twist with the summer theme. Sun-Kissed is the lighter and warmer option of the two, it has a pinkish undertone which makes it more wearable and natural on my skin. Bronzed is the deeper option and gives my skin a more bronzed brown look. For my medium skin I prefer Sun-Kissed right now – it just looks more natural while Bronzed borderline makes my skin look a bit weathered as it’s more brownish and deep. I love a good bronze but these days try to go a bit easy on it since I’m not as tan as I am in the summer time. They are different enough to justify owning both – I think fairer skins will prefer Sun-Kissed. Deeper skins will probably find Bronzed better for their skin tones. Neither turns orangey and I was relieved to find they did not darken on the skin. The texture is very smooth and the blend nicely on the skin without any streaks. 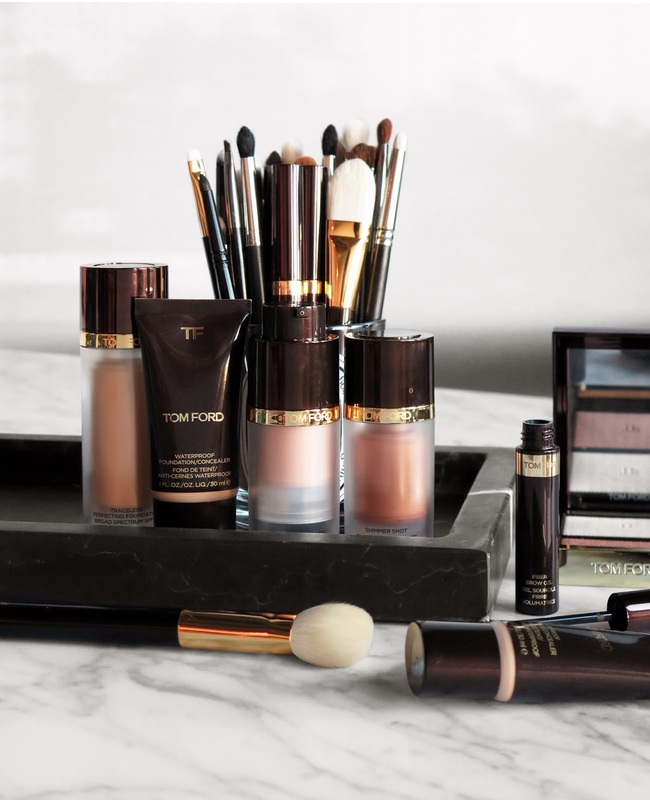 If you’re super fair I’d recommend you opt for either Gold Dust or Terra from Tom Ford instead as those will look more natural on the skin. In terms of performance all the cheek products work very well. The quality is excellent and I really didn’t know what to expect before hand since the Naked Flushed palettes did not work for my skin type at all (they look super chalky and emphasize pores on me). I think the UD x Gwen Blush palette is the winner and if you’re trying to narrow down your picks, I’d say opt for the palette since it will give you the most options packaged in a single convenient compact. If you like more visible pigment or color for the cheeks you may find the Blush Palette too sheer or natural looking. In that case I’d recommend you opt for the NARSissist Cheek Studio Palette which has more pigment and more color but will also give you a wide range of options. The highlighters are really pretty but I can’t say any of them are absolute musts. If I were to pick one favorite it would be Fireball – the mix of peach and pink is really pretty although it’s nearly identical to one of the shades in the Anastasia Gleam Glow Kit, the UD one performs exceptionally well. The Bronzers are nice to have but not musts. That being said I find it rare to find good matte bronzers that are smooth in finish and application that don’t darken. 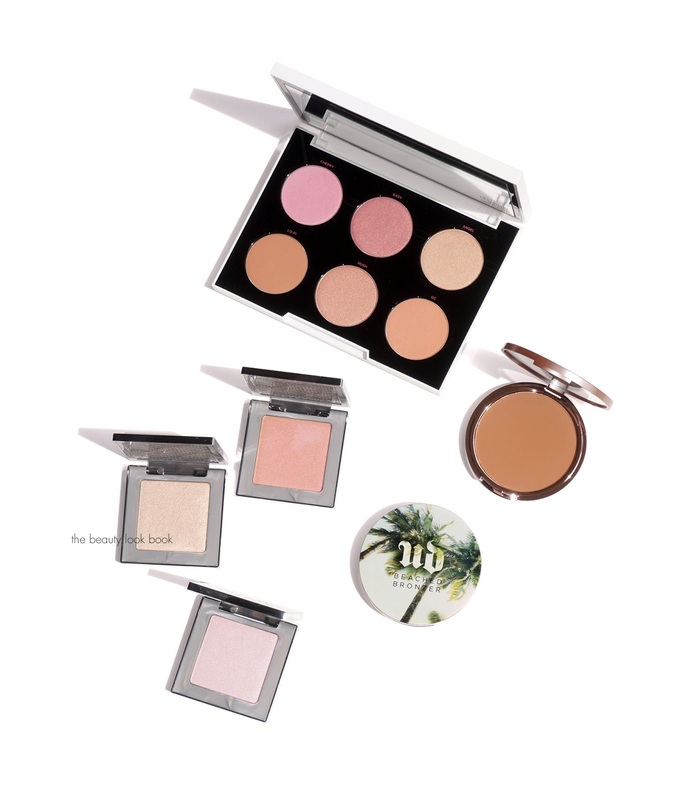 The ones from Urban Decay perform really well – I like Sun-Kissed the best and the packaging is fun for the upcoming warmer weather months. Even though I can probably find similar shades in my collection to all the cheek items featured, I don’t have any regrets purchasing them – the formula works really well to add color or highlight without emphasizing pores. You can find the Urban Decay cheek palette, bronzer and highlighters at all Urban Decay counters now. Online at Sephora, Nordstrom, Macy’s, Ulta Beauty and Urban Decay. Have you checked out any of the items yet? What did you think?